Adding outdoor lights to a patio, backyard or other type of outdoor living space is a great way to increase the functionality of the area while also improving the aesthetics. Incorporating a gentle warm glow will make any space feel relaxing and inviting, but lights do so much more than add ambience. 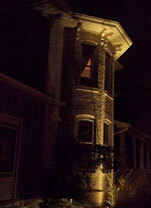 Installing a combination of lighting systems in your yard will aid visibility, deter intruders and make guests feel safe. Here are a few of the ways you can increase safety and security in your backyard by using outdoor lights. No matter how flat the landscape, there are always a few hazards for people walking around. Curbs, steps, hills, raised flowerbeds and trees are just a few of the possible obstructions found in a yard that could easily injure someone if they’re not aware of these obstructions. 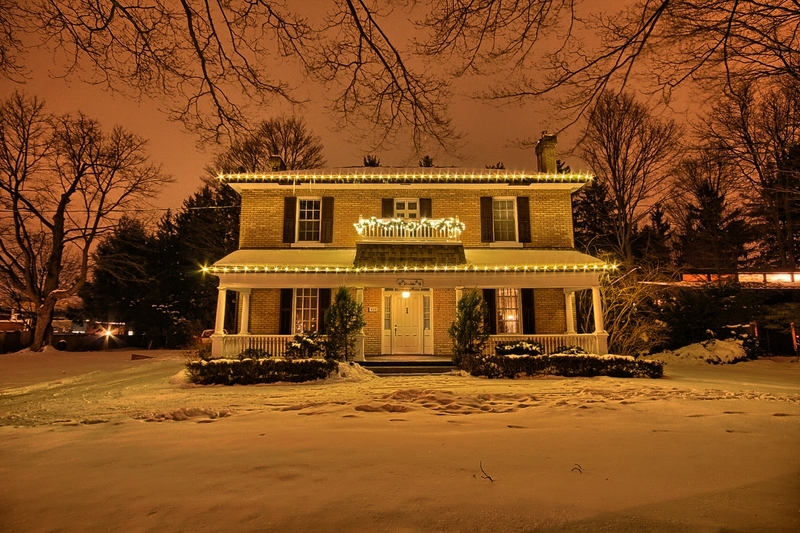 Adding spotlights to areas that present risks is essential for anyone planning to have guests on his or her property at night, whether entertaining or just walking around (Halloween!). Bright lights that focus on the street, alleyways, the side of the house and all entrances and exits don’t just make your house look bright and cheery from the outside; they also make the house look like an unreasonable risk for burglars, who will likely look elsewhere for an easier target. Motion detecting lights are particularly good for deterring intruders, as they’ll scare anyone lurking in the dark by suddenly popping on, as if someone manually turned the lights on them. If you love hosting backyard parties or dining outside, cooking on the grill is probably a common occurrence. Coals, gas and fire add some light to the area but cooking by moonlight isn’t always great. Install some specific task lighting to limit any risk of burns, fires or other issues. 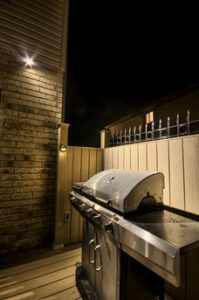 Handheld lanterns work well if the BBQ doesn’t see much use, but if summertime means outdoor dining regularly, consider setting up a dedicated lighting system that illuminates the cooking area without flooding other sections with uncomfortably strong light. Walkways leading up to the house and around the garden outside should always be well lit. Anyone walking can easily trip or slip if it’s rocky or wet. Solar pathway lights are easy to install and turn on automatically when the sun goes down without any effort on your part. Because they use the sun’s energy to charge, they’re eco-friendly. 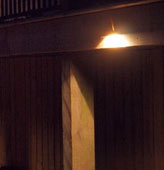 Additionally, pathway lights are appealing and they come in a variety of decorative styles that enhance the area both in safety and beauty. 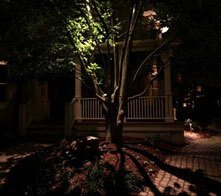 A darkened house is likely an empty house, and one burglars will recognize as a prime opportunity. 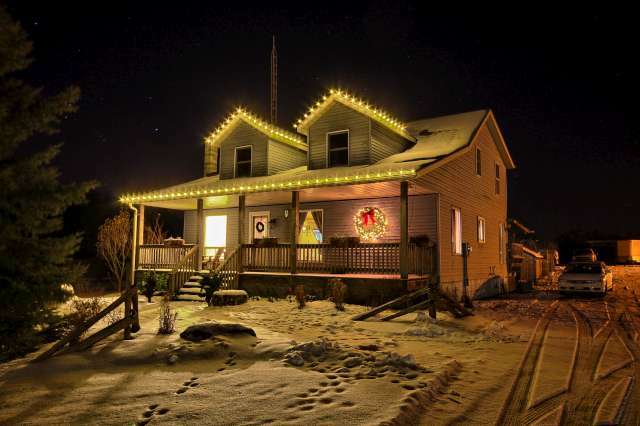 While it can be wasteful to leave lights on inside the home to make it seem as if someone is there, solar lights and inexpensive outdoor lighting can be left on to dissuade uninvited guests from popping by without driving up your utility bill. Better yet, a motion detecting light will only turn on when someone pops by, scaring away would-be robbers but only using a bare minimum of energy. 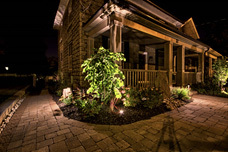 There are many benefits to adding outdoor lighting to your home, but most important of them all is the increased safety and security to both you and the friends and family who visit. Safeguard yourself and loved ones from falls and your house from intruders by installing a few essential lights where they will do the most good, and sleep well at night knowing you’re protected. 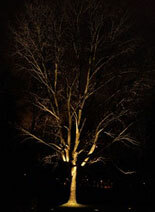 We can design an outdoor lighting system that is both beautiful and functional. Call us today for a consultation. It’s lovely spending a long weekend evening watching the moon and stargazing but as beautiful as these cosmic lights are, they’re not bright enough to provide enough light for entertaining groups big and small in the backyard. 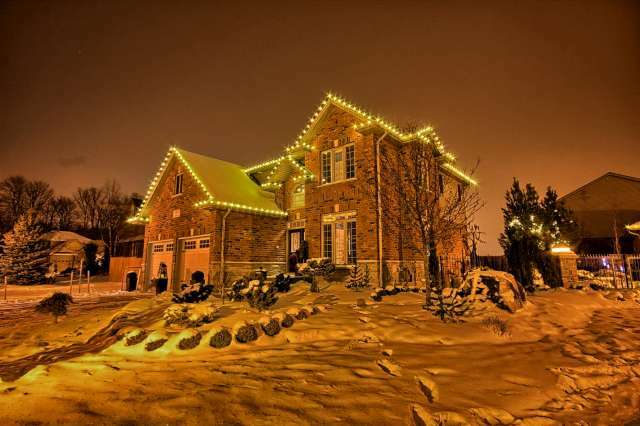 To make the most of an exterior space, outdoor lights are essential. Fortunately, there are many different styles of outdoor lighting that can add a warm glowing ambience, clear direct spotlight or subtle highlight to various areas of the yard when you’re entertaining Canada Day weekend. These lights allow homeowners the chance to enjoy extended gatherings with friends and family in luxurious surroundings regardless the time of day. Here are just a few ideas of how to add beauty and functionality to a garden or patio this long weekend with outdoor lighting. 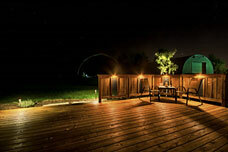 One of the most versatile and eco-friendly options for lighting an outdoor space is solar lighting. Easy and attractive, solar lights come in a variety of different forms, including minimalist pathway lights, vintage lanterns and direct spotlights. Most solar lights provide a warm glow that adds a welcoming ambience to get-togethers – exactly what you want for wine and cheese as fireworks light up the sky. Spotlights, floodlights and motion detectors, on the other hand, serve well for safety and security reasons. 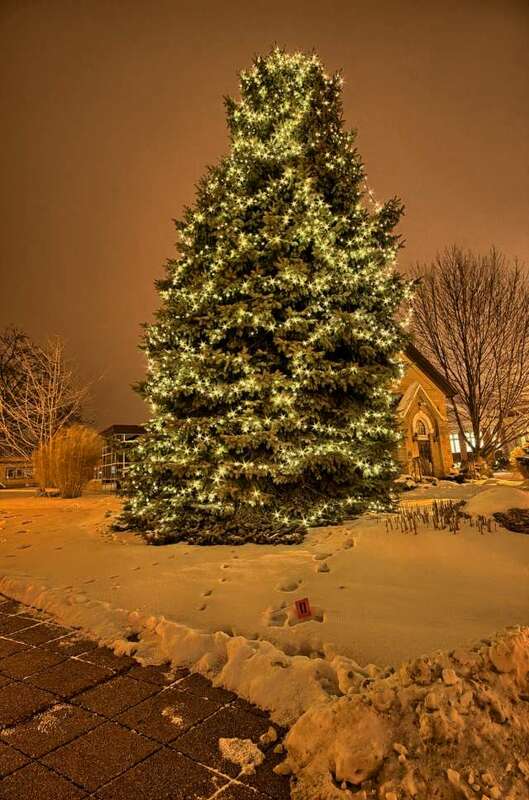 A clear view of the sky is necessary wherever the lights are installed, so if there are many overhead trees or buildings, it may not be possible to use them or they may not charge enough during a regular day to last late into the night. Outdoor lighting is as much about decoration as it is visibility, and string lights definitely add a stylish touch to any patio. String lights are easy to hang in a variety of locations, including on gazebos, in trees and around fences. Soft yellow or white colours are the most popular choices, but they come in an unlimited array of shades, making them particularly suitable for a holiday event or special occasion with a theme – perhaps red and white this weekend. Another benefit of string lights is that they can stretch as long as you want them to. Extensions are easily added to suit any surface. They are more labour intensive than more permanent light fixtures and chances are you won’t leave them up after the weekend is through. But you could! More designers today are using these “twinkle lights” as regular additions to smartly designed and regularly used outdoor spaces. While lights should always add beauty to a space, many must also serve more functional purposes. Task lighting in areas where people congregate is essential not only for safety reasons, but also to ensure that friends and family can converse, drink, dine and move around with ease. Task lighting should never be so bright that it causes discomfort or breaks the mood of the festivities, but it should provide enough illumination to make activities comfortable. Areas that call for task lighting include pathways, cooking areas like the barbecue, dining areas and entrances/exits. Make sure all your bulbs are working before guests arrive this long weekend and showcase your property at its best. It’s easy to behold the beauty of a well-kept garden during the day, but at night all the unique details and features may disappear in the darkness. Using garden lighting to highlight the various floral elements in the garden is an art form that can instantly improve the look and feel of an outdoor space. Pathway lights on stakes at knee-height work well to illuminate stone walkways that may otherwise go unappreciated. 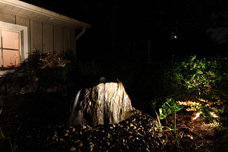 Solar lights disguised as rocks can brighten bushes and shrubs, and swinging lanterns featuring candles or flameless battery-operated lights help outline the border of a yard elegantly. 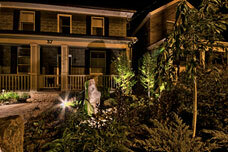 Adding outdoor lighting serves two important purposes: function and aesthetics. To celebrate our beautiful country, most people like to move their evening activities to the backyard, where they can better appreciate the cool summer breeze and colourful fireworks. But in order to make the most of this location, a few well-placed lighting elements are necessary to fully capture the mood and beauty desired of outdoor entertaining. Contact us today to get your outdoor space properly lit and celebrate Canada Day in style. Warm summer evenings and longer days beg for more time spent outside, and what better way to make the most of the season than to enjoy drinks, dinner and parties out on the backyard patio? There are many ways to extend the functionality of your outdoor living space in order to make the area more inviting for friends and family to use, and many are easy to complete and inexpensive to finish. Here are a handful of ideas that not only make it more comfortable and easier to enjoy the backyard, but also make it more attractive. Pick and choose between elements to build your ideal outdoor space. The first step to creating an outdoor living environment is setting up a cozy area to relax, enjoy a beverage and talk about the weather. Patio furniture comes in a nearly limitless selection of styles, colours and designs, so there’s something for every taste and backyard. Wicker furniture is particularly popular, as it’s durable and lightweight, but wood, cast iron, wrought iron, cast aluminum and plastic furniture are also available. Start with a simple table and chairs so friends can enjoy a bite to eat together. If there is space, adding lounge chairs for sunning or napping is certainly appreciated. Don’t forget about hammocks, pillows and sunshades; these items create an especially welcoming, and varied, space. Illuminating your outdoor space does more than make the area visible and functional after the sun goes down, it also adds a warm and inviting ambience both to the area as a whole and certain highlighted parts of the yard. 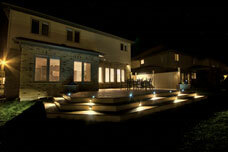 Outdoor lighting is essential in every area that sees use. Add overhead lighting with LED bulbs where guests will dine. 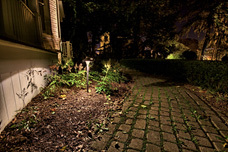 Install solar pathway lights along walkways for safety and highlight garden features with spotlights. Finally, make sure to include brighter task lighting where important activities like cooking, playing games or entering goes down. While soft lighting works best where people are relaxing, direct, bright lights are necessary over the barbecue and wherever there’s a hazard. Move meals out of doors by setting up a small outdoor kitchen and dining area on a patio or under a pavilion. A large all-weather table surrounded by comfortable chairs, pillows and fresh air is the best way to enjoy a casual dinner with friends and family throughout the summer. Make sure to invest in a quality barbecue or grill, either charcoal or gas, and equip the area with all the necessary tools for cooking under the stars like tongs, a meat thermometer and excellent lighting. Another way to cook food is over a fire pit, which also doubles as a gathering area to tell stories and connect. Keep bugs away by using lighting all over the yard, ensuring the insects aren’t focused on one source of heat. Summer isn’t all about relaxing; it’s also an opportunity to enjoy activities outside. Popular yard games include croquet, Frisbee, bocce ball and toss games. Set up a play area or a few play areas to keep both parents and kids busy. When the sun goes down, make sure to set up lights around the yard so the games don’t have to stop just because it gets dark. Lanterns, pathway lights and spotlights all work well for this purpose. Remember, using lots of lights spread out over the yard helps keep bug swarms to a minimum while also making the yard safe for activity. Summer means more time spent outdoors, thankfully. But summer also means it’s time to spruce up the yard and patio so others want to hang out there. Adding comfortable furniture, welcoming and functional lighting, a grill and a play area instantly transforms a typical lawn into an outdoor living space everyone will enjoy. Give us a call today to see the difference our lighting designs can make to your property.